…you can’t keep up with your garden during the weeks of moving…they get over ripe! 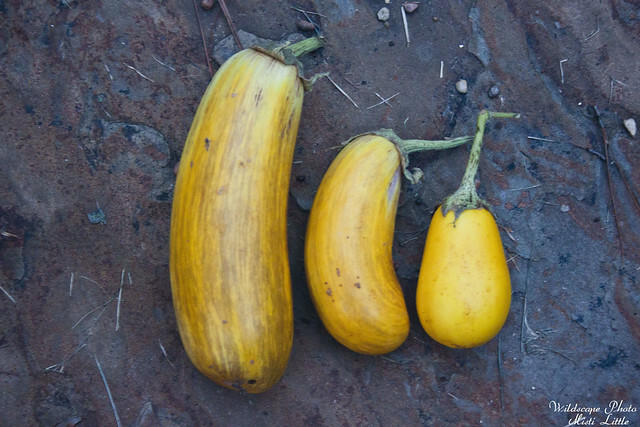 I was actually kind of interested to see this phenomenon, overripe eggplants as they are a really cool color. I’ll be opening these up soon to see about saving seeds from them. In other news of excitement the rest of our seeds have been returned to us with the arrival of our storage unit. I’m excited to go through them and see what I can start for the fall—veggie and ornamental flower wise. I spotted Pride of Barbados and though Chris wants to buy an already grown plant, I would like to start them from seed too. Tom had MORE than a few of these guys when he was growing eggplant. When I started gardening, he briefly gave it a whirl, but he put all the things he wanted to grow on the other side of the house. And he sort of let them go… I would have watered for him, but it was way too difficult for me to carry the house all the way around to them. All the eggplants looked like these guys! Anyway, I bet you are happy to be getting back into a regular routine again, right? I can’t wait to see what you plant, and the progress of your garden! I think one plant of eggplant would even be to much of me. Since I’m the only one to eat it.